I looked at these in the Keighley branch but was put off by the temperature in the shop which meant that the bars were soft enough to be folded in half. Yuk. I won't be buying chocolate in that place ever again. I looked at these in the Keighley branch but was put off by the …I looked at these in the Keighley branch but was put off by the temperature in the shop which meant that the bars were soft enough to be folded in half. Yuk. I won't be buying chocolate in that place ever again. Put them in the fridge ! How do you think it’s moulded into the bar shape? It then travels in a hot lorry and onto the shelves. The temperature is the same in Ashford store, all the chocolates are liquid, I used to wonder why their chocolate always tasted off. Even after putting in the fridge to solidify it, it tastes off, surely its not good to store food in such high temperatures. The temperature is the same in Ashford store, all the chocolates are …The temperature is the same in Ashford store, all the chocolates are liquid, I used to wonder why their chocolate always tasted off. Even after putting in the fridge to solidify it, it tastes off, surely its not good to store food in such high temperatures. 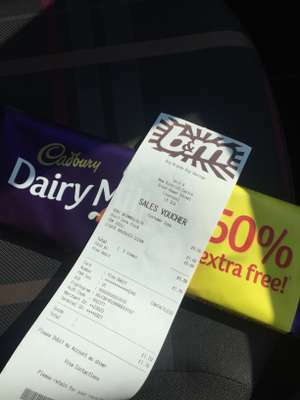 I think you lot are expecting a lot from a bargain shop, you seriously think they are going to air condition the shop just to keep the chocolate bars from melting? how do you think they keep their prices low? were having an unusually hot summer, id be more worried if the chocolate wasn't going soft! its not going "off"
As usual, not in a shop near me. no b&m or HB. Thanks Jack1997. Just picked a couple up in my local branch.